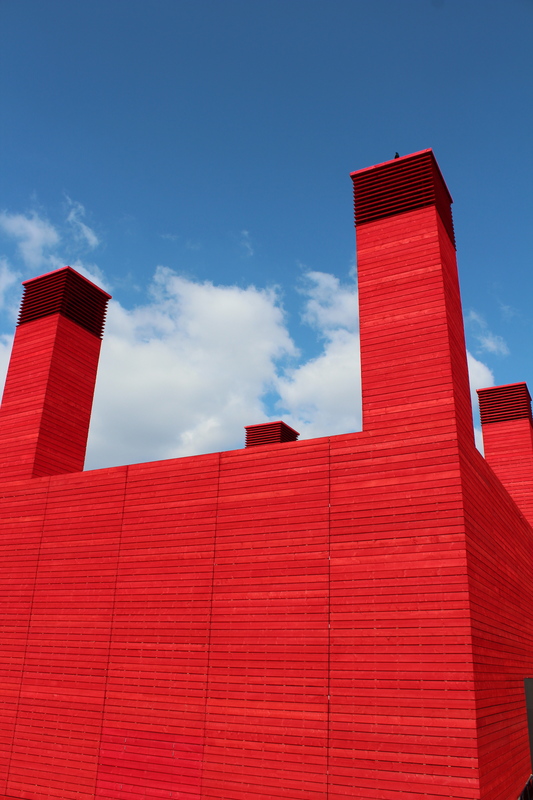 Anyone passing South Bank recently could hardly fail to notice its latest addition – a bright red, wooden fortress-like building. 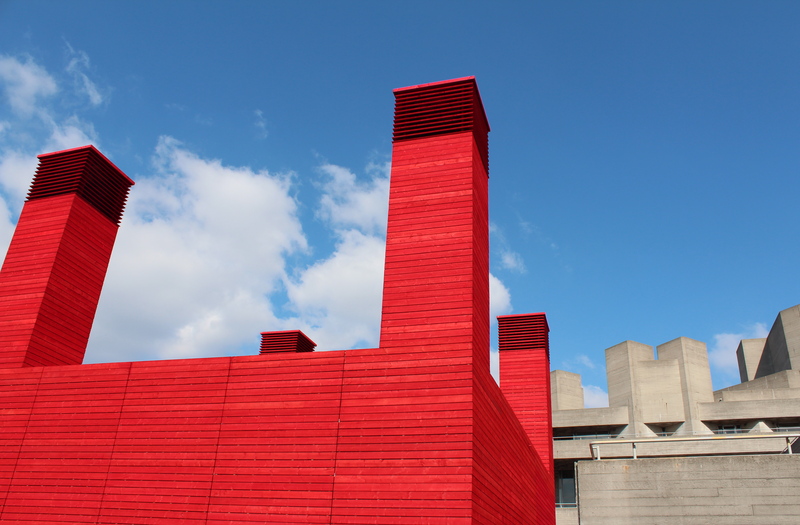 This is in fact the National Theatre’s latest innovation – a temporary theatre space known as The Shed. 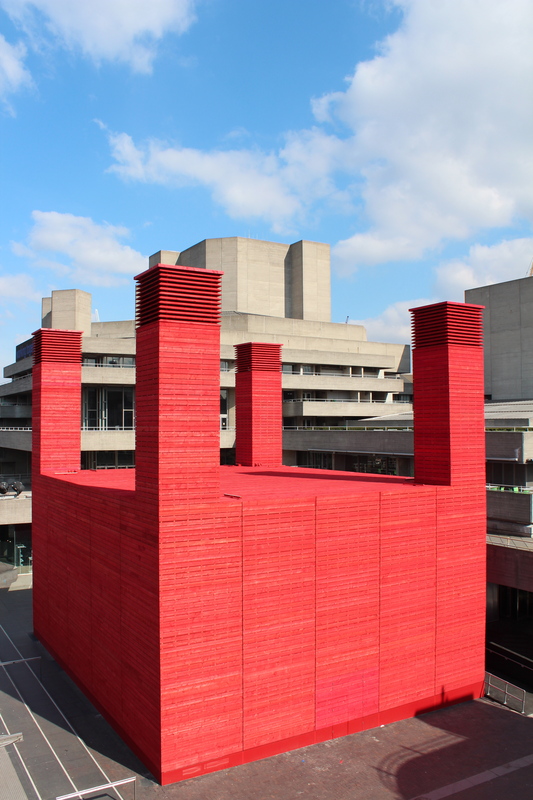 Designed by architecture firm Haworth Tompkins, this structure took just 18 weeks to erect and is built to last less than a year. 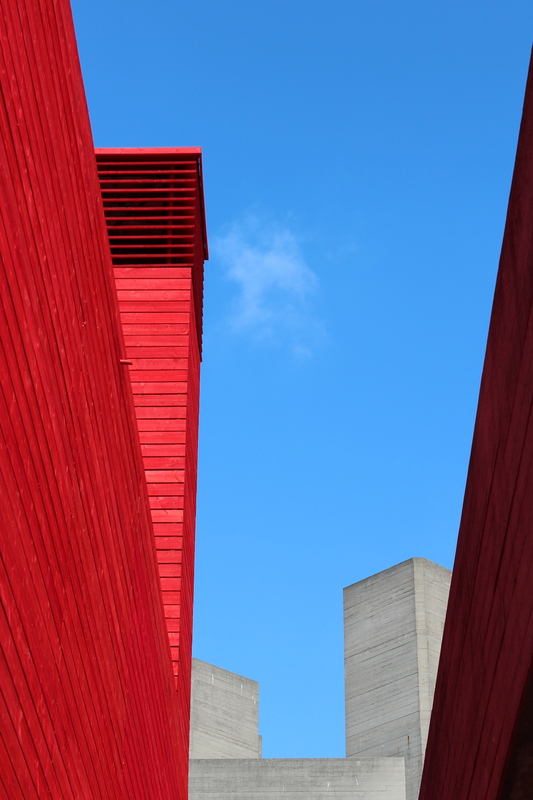 Its vibrant red colour creates a strong contrast with the grey, brutalist concrete structure of the main National Theatre venue. 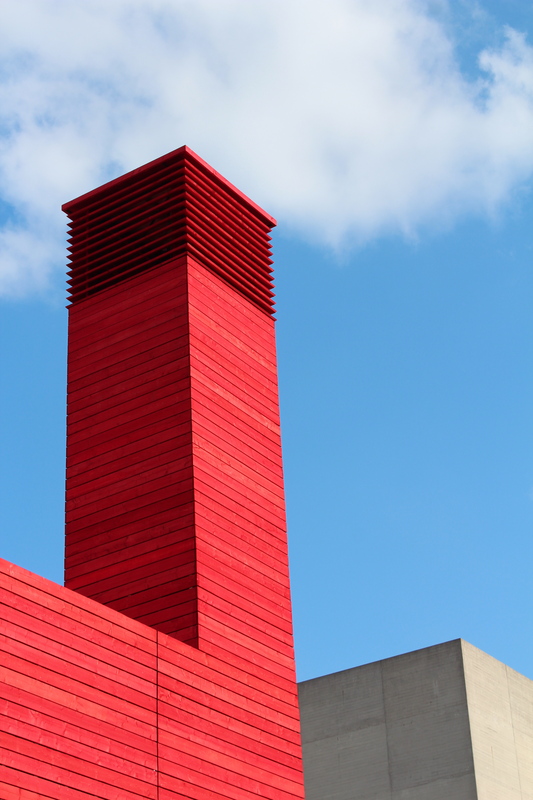 With its four chimney stacks reaching into the skies along the river, The Shed immediately reminded me of Battersea Power Station, just up river from here. Its towers are actually an energy-saving mechanism, as the stacks avoid the need for mechanical ventilation by drawing air in naturally from under the seats. I’ve been waiting weeks for the unseasonal snow and rain to pass so that I could photograph The Shed in the bright sunlight and blue sky that would set it off to great effect. After keeping one eye on the forecast over the entire Easter weekend, I was finally rewarded with some decent weather around 3pm on the Monday. 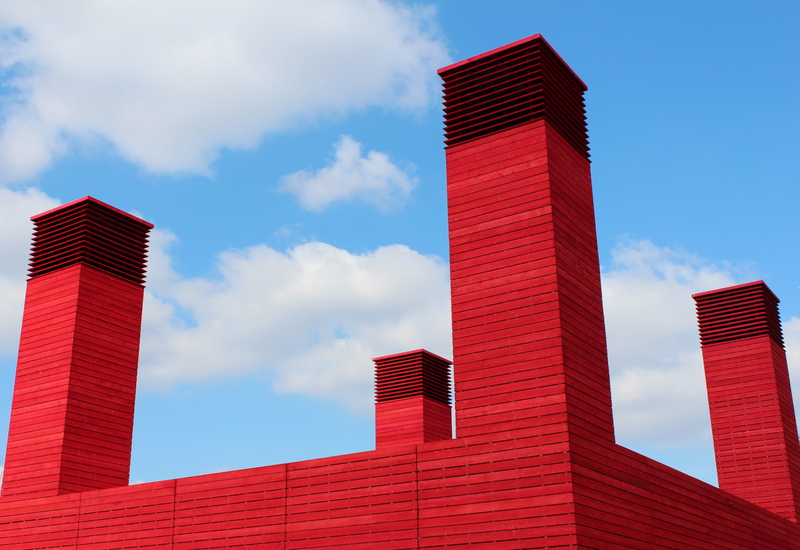 The clouds present enhanced the power station effect, appearing at times like plumes of smoke from the chimneys. 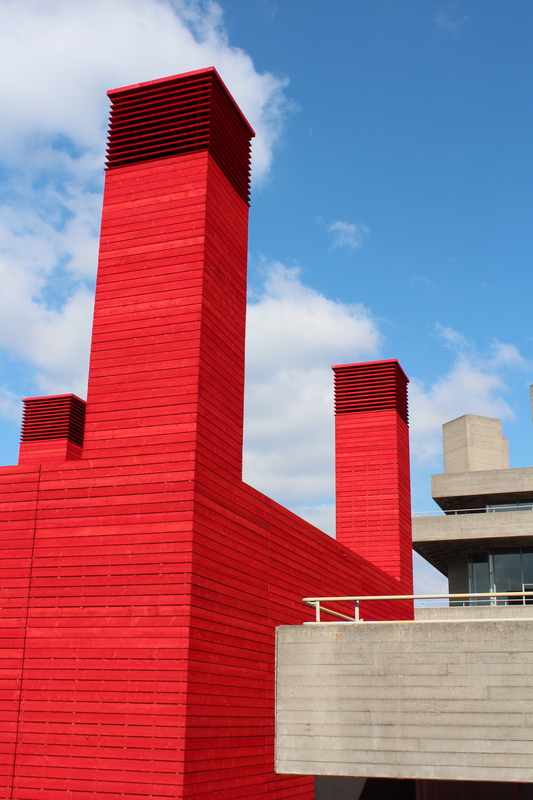 When viewed from Waterloo Bridge, the structure’s almost cuboid shape really comes to the fore. Later, the fortress imagery reasserted itself when editing the photos, as they reminded me of ones of Stoke Newington Pumping Station, the design of which was based on a castle. 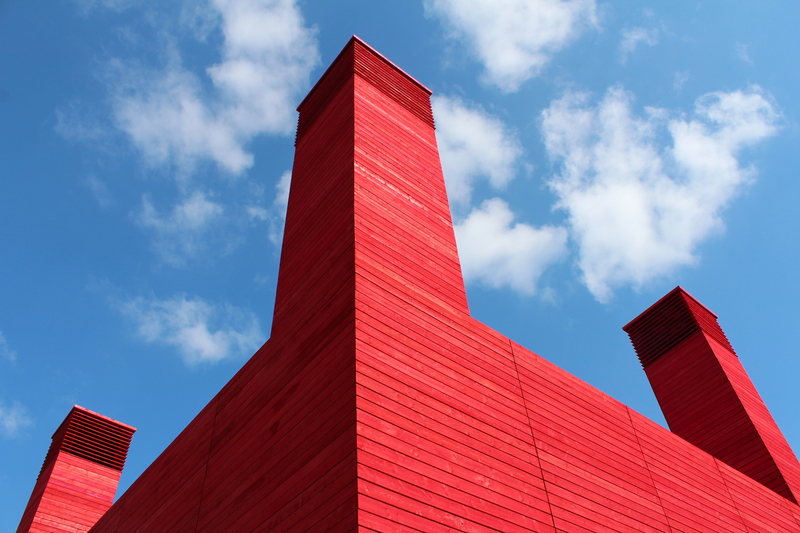 The Shed will play host to a number of experimental theatre productions, priced at only £12 or £20 per ticket. Performances start on April 9th. 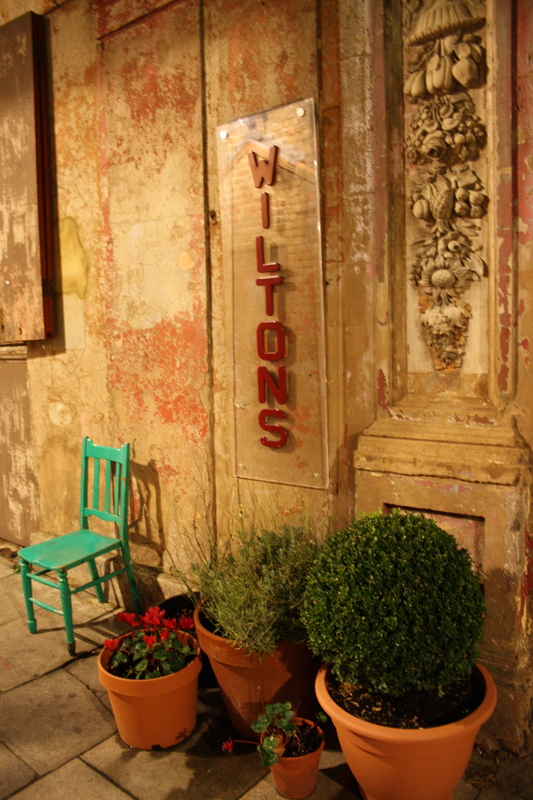 No one does faded grandeur quite like Wilton’s – not just England’s, but the world’s oldest surviving music hall. 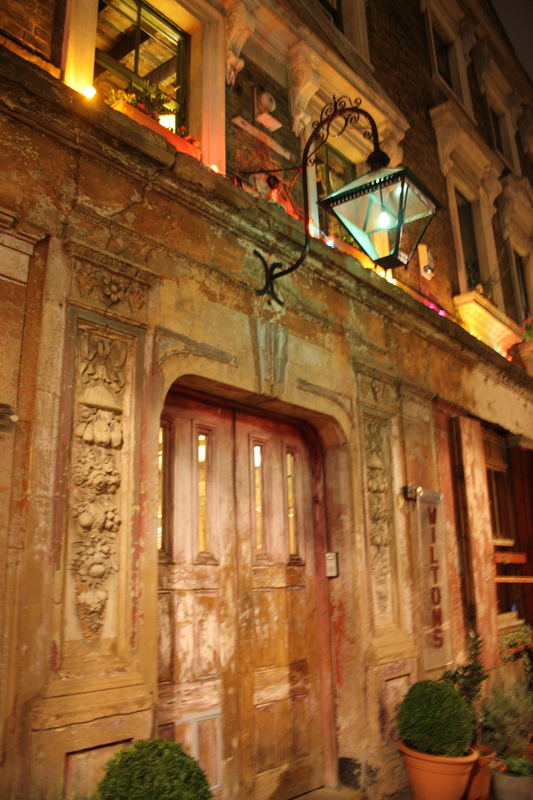 Its peeling columns, ‘barley sugar’ cast iron pillars and old Indian frieze create an unforgettable atmosphere. Like all special places it’s best seen for yourself. But although the effect is somehow glorious, this isn’t just shabby chic decor – much of the decay is real. Wilton’s has been seeking support and funding for years for much-needed renovations, and has finally just had some success on this front – so this is a story with a happy ending. The story starts in 1858, when John Wilton had the hall constructed along the back gardens of the terraced houses that form the front area of Wilton’s. A tavern was previously found on the site – and said to be very popular with sailors from around the globe. It was often referred to as the Mahogany Bar due to its fixtures. 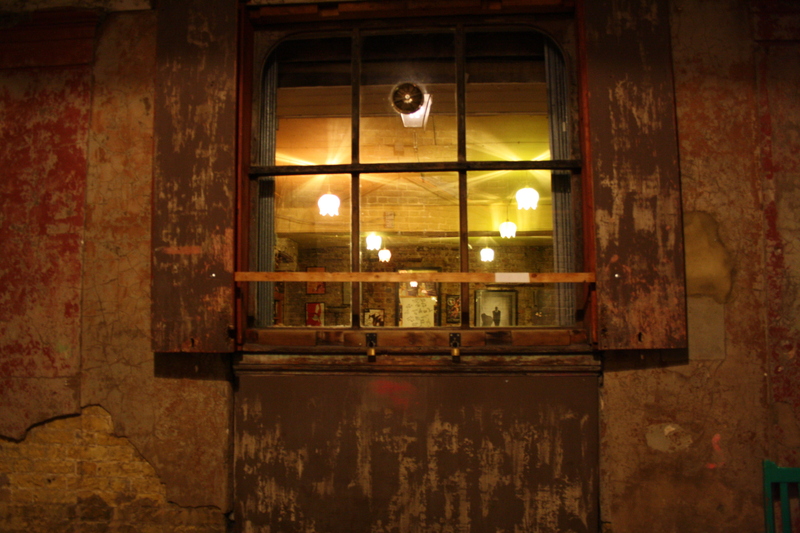 The bar was retained as the main entrance to the original music hall, and today the name is used for the gloriously cosy drinking establishment you can still patronise at Wilton’s. Wilton’s great initial success as a music hall was not deterred by a major fire in 1877, and it was rebuilt the following year. Music hall luminaries such as Arthur Lloyd and Champagne Charlie trod the boards here, while its patrons could chose between the ladies of the night waiting at the top of the stairs and the more respectable seats downstairs, suitable for wives and girlfriends. Supper tables were also available, as was a promenade area for standing patrons. Entertainment was of the variety show type, including dancers, magicians, burlesque, comic and a wide range of musical talent. But the popularity of the music hall genre eventually waned and new fire regulations in 1880s were the final death knell for the hall. Ironically, it was the Methodists who ended up saving Wilton’s. 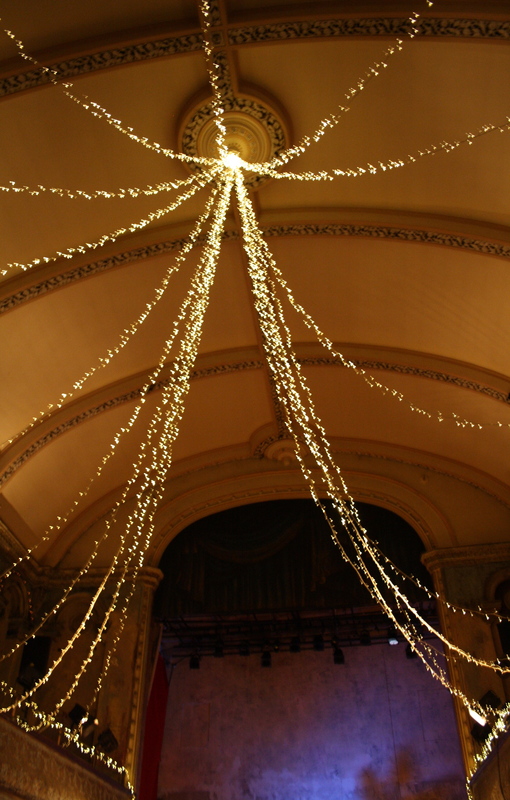 They turned the music hall into a mission hall – and because its almost chapel-like interior suited them perfectly, they simply left it like it was and preached amongst it…and the rest is history. The building also provided shelter for locals during the Blitz and was a rag sorting depot for a time. Today it numbers among its patrons the rather unusual combination of Prince Charles and David Suchet (a.k.a. Poirot). A wide yet discerning range of entertainment is now on offer, including music, theatre, cinema and comedy. And where else but Wilton’s would you attend a magic show – as the Londonphile did in December – only to discover that Marc Almond was popping by to sing several Christmas songs? It is also a popular venue for filming, and recently played host to the latest instalment in the Sherlock Holmes franchise – although keen eyes will notice that the filmmakers ‘added’ an extra floor to the hall. But Wilton’s is worth a visit in its own right. And you can always just pop by the Mahogany Bar for a drink (it’s open most weeknights – check the website) – the ornate bar itself is a left-over donated after the Sherlock filming. And on Monday nights at 6pm you can learn more about Wilton’s history and architecture on a guided tour for just £6, which I highly recommend. And so to that happy ending. After years of courting funding and support, Wilton’s recently received £700,000 from the SITA Trust for restorations. 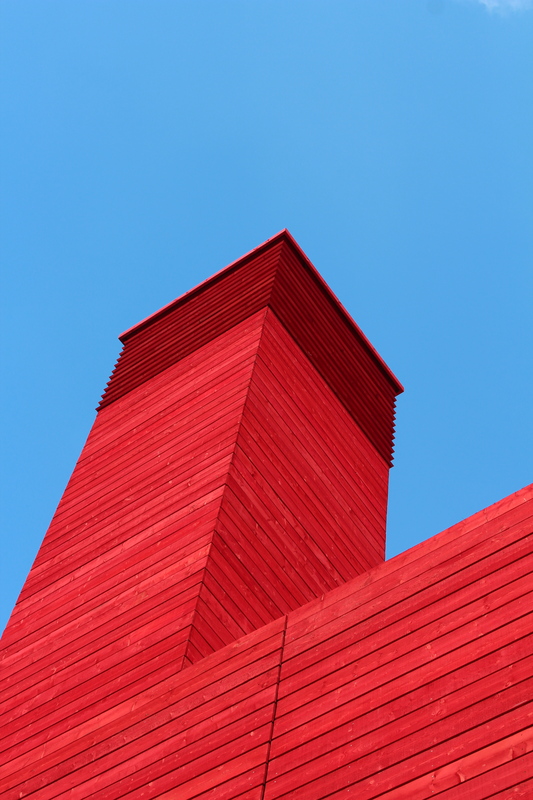 This funding means phase 1 of the Capital Project for crucial work on the auditorium can be completed and, importantly, stands Wilton’s in better stead when applying for further money for phases 2 and 3. Another £2.2 million is still required, so pop by, have a drink for charity and check out the glorious surrounds of this magical music hall. After all, Poirot can’t be wrong! Back in Elizabethan days, the Rose Theatre was overshadowed by its newer, larger rival, the Globe. Sound familiar? Some 400 years on the Rose still languishes in its neighbour’s shadow, fighting for survival and public support. 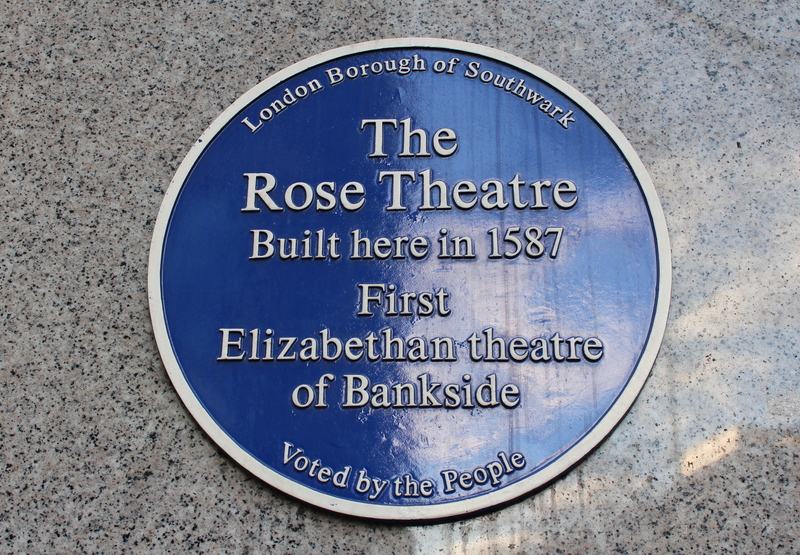 The Rose was Bankside’s first theatre, built in 1587 on land that had been re-claimed from the Thames, pre-dating the Globe by 12 years. Its remains were discovered in 1989 during the development of a new office building. Around two-thirds of the theatre’s ground plan were eventually uncovered by archaeologists. This excavation revealed many details about the design of Elizabethan theatres – knowledge that was used in the reconstruction of the Globe. It is now the only complete Elizabethan theatre site still available for excavation. The campaign to save the site created one of London’s many oddities – the office complex was eventually built suspended above the remains. 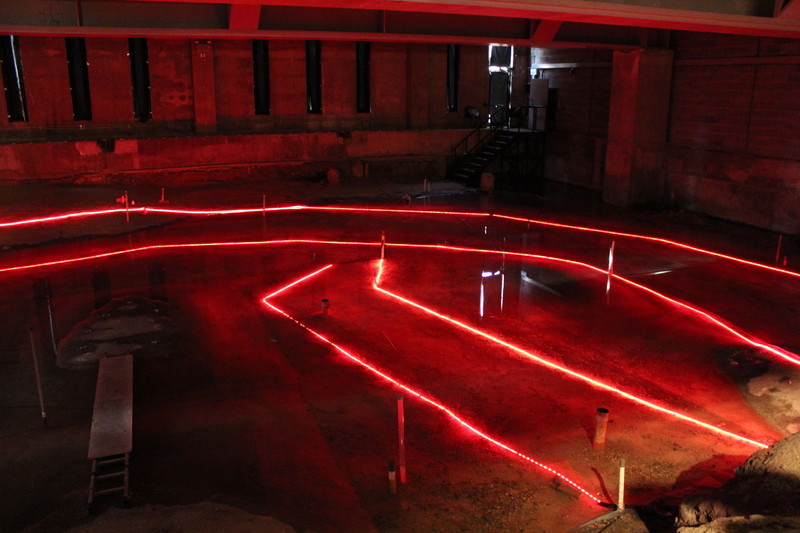 Today red rope lights mark out the size (surprisingly small) and shape (that of a 14-sided polygon) of the original theatre, where Shakespeare once trod the boards. Its foundations are covered with a layer of water to prevent cracks developing. The Rose Theatre Trust is seeking funding and donations to complete a full excavation of this unique site. Ready for your one-minute of fame (sorry but due to the economic crisis this has now been cut-back from the standard 15)? Well then roll-up to the Roundhouse on Sunday 15th January for Mama Quilla’s Theatre of Protest: From the Streets of Revolution event, which features a choir workshop, open to all, leading to a one-minute performance later in the night. This evening of linked events is based around responses to last year’s riots in both London and Libya. In addition to short plays about London, a live cross will update attendees on goings-on at the Occupy London site at St Paul’s. The entire event will be filmed by Lise Marker to create a new short film exploring protest. Tickets are £10, or £5 for concessions, and the first act kicks off at 4pm.